Discussion in 'vBench (Works in Progress)' started by KenBoyle, Oct 6, 2017. 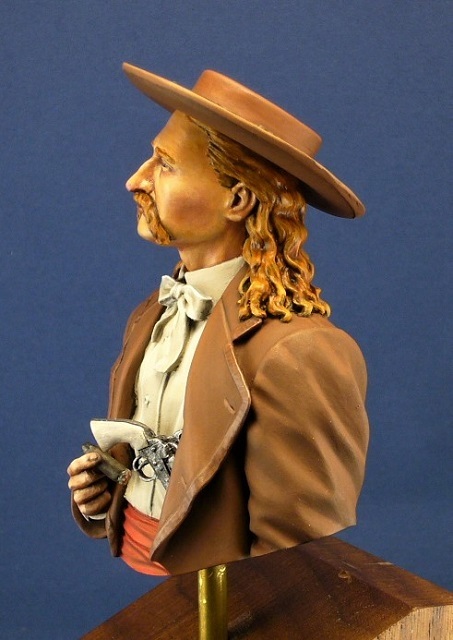 As I had mentioned at the end of my earlier Wyatt Earp Bust thread, here is my latest project, a 1/12 scale Wild Bill Hickok bust also sculpted by the talented Mike Good for Jaguar. 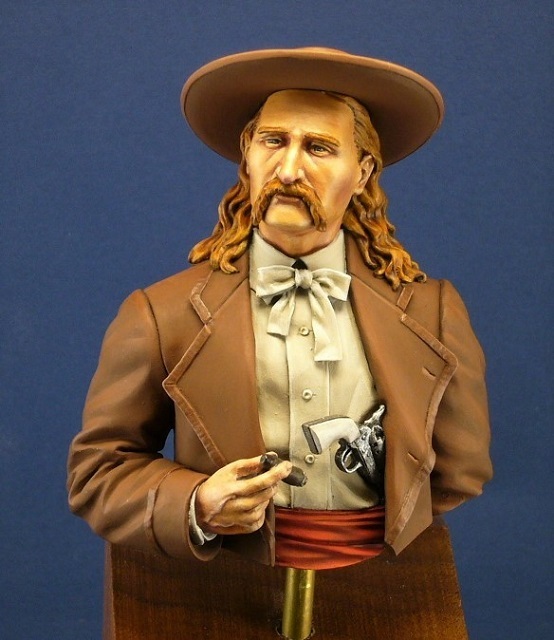 This was based on a popular black and white photo of Hickok and the colors are a best guess. 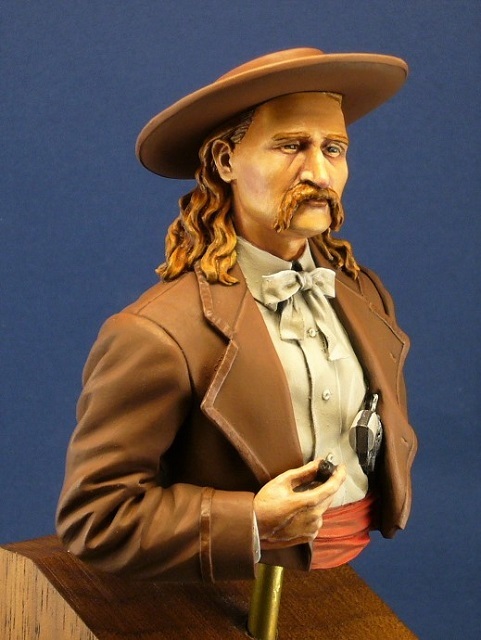 I followed the box art pretty closely and went with shades of brown especially since my Wyatt Earp bust was primarily blacks and grays. 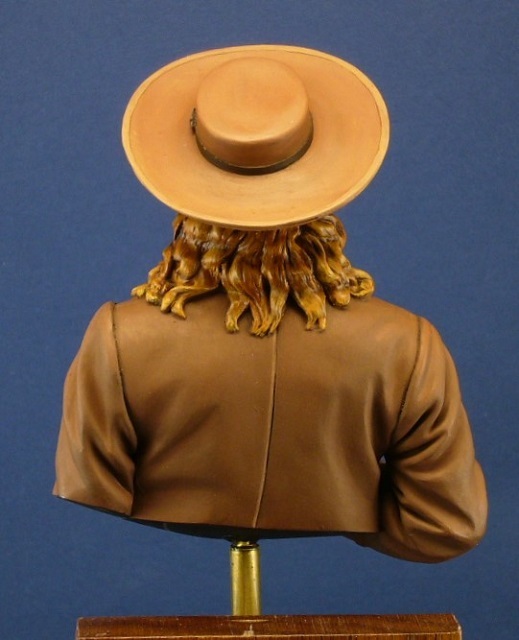 The bust is pretty straight forward and nothing was changed. There were however, several air bubbles in the casting and the right side of the nose had to be reconstructed. 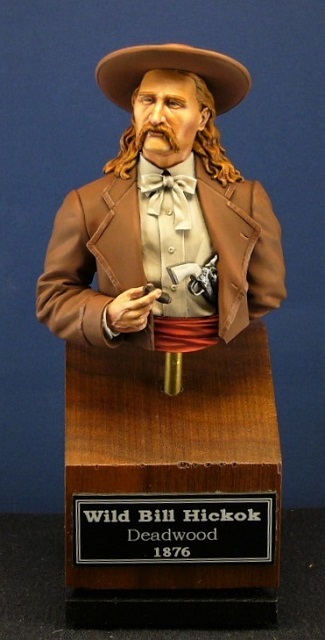 This was fixed with Vallejo plastic putty and Apoxie Sculpt. As usual, it was painted entirely in acrylics. Maciej, phil_h, marco55 and 17 others like this. Another fine paint job Ken, looks superb. Thanks Ralph, Bob, Mike, Mobo and Marc for the kind comments. Not the most colorful figure. But I enjoyed painting him, nevertheless. WOW that is some very fine brush work Ken. Thanks Andrew for the kind words. Thanks Brian! I agree, Mike Goods attention to detail is very nice. Very subtle Ken, I like it. Well done. Thanks Tony, Mike! My first pass had more drastic highlights and shadows on the jacket but it was too overwhelming so I used a wash/filter to tone it down. Getting the right balance for me is always a challenge. Well done Ken nice transitions. The rumors of my demise are highly exaggerated. Talking about me in the past tense is a bit of a downer. I am still at it! KenBoyle and Michaelminiatures like this. You were always and will always be one of my favorite sculptors. Thanks for creating figures that are a joy to paint. Very nice work Ken. I think the colors all harmonize very well together.